Bowling Green's Chris Nell makes a save against Bemidji State earlier this season in the Slater Family Ice Arena. The junior had 19 saves Saturday in BG"s 2-1 overtime victory against the University of Alaska (Photo by Todd Pavlack/BGSUHockey.com). Chris Nell provided Bowling Green with a second chance Saturday night. 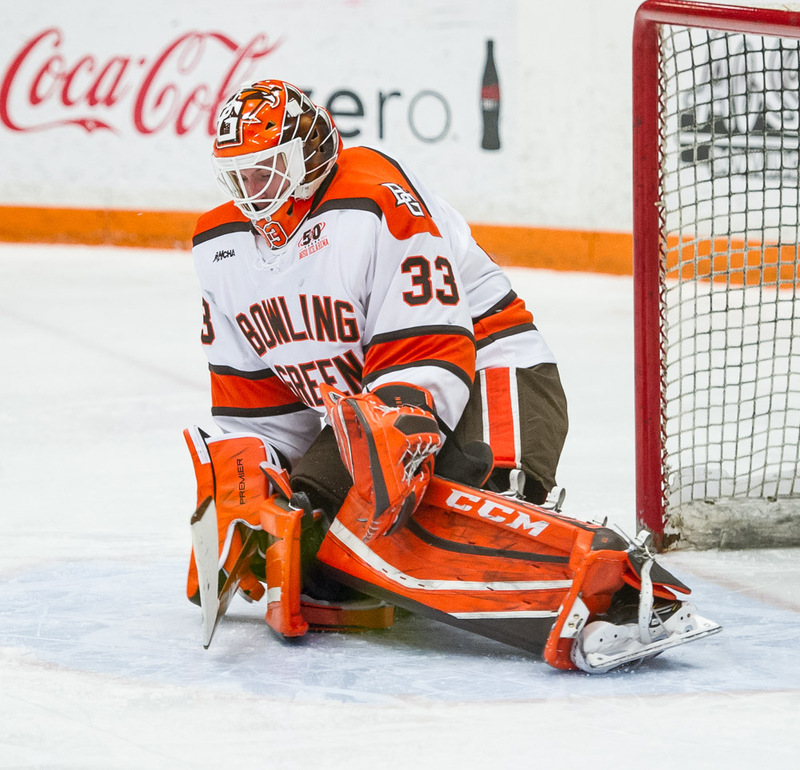 The Bowling Green junior made 12 of his 19 saves in the first period, enabling the Falcons to survive a slow start in the Slater Family Ice Arena. 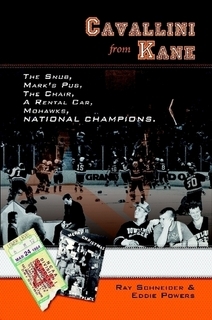 They eventually erased a 1-0 deficit and posted a 2-1 overtime victory against the University of Alaska (Fairbanks). Brett D’Andrea scored 3:57 into the 5-on-5 overtime to give BG the win and a full three points in the Western Collegiate Hockey Association standings. The victory handed BG a split of the series after the Falcons suffered a 3-2 loss Friday. They had plenty of scoring chances in the series opener, but had just the two goals, weren’t sharp defensively and gave up a soft goal. The Falcons moved into third place in the WCHA, one point ahead of 20th-ranked Minnesota State, although the Mavericks have two games in hand. BG has 35 points in the league, seven ahead of fifth-place Lake Superior and eight ahead of sixth-place Alaska. But Lake Superior and Alaska also have two games in hand on the Falcons. “That was a big win,” D’Andrea said. BG forced overtime on Kevin Dufour’s power-play goal with 14:14 left in regulation. The Nanooks opened the scoring on Josh Erickson’s goal with 10:18 remaining in the second period, but they didn’t solve Nell again. Alaska also could have built a multi-goal lead during the first period, but Nell was sharp. The Falcons are 13-14-2 overall and 11-10-1-1 in the league. Alaska is 8-15-3, 7-10-3-3. THE WINNER: D’Andrea scored the winner as he skated in alone from the right wing. The junior forward started the play by tipping Alaska’s cross-ice pass just inside its defensive zone. He then chased the puck down near the top of the circle. D’Andrea fired a forehand wrist shot into the bottom, left corner of the goal against Nanook goalie Davis Jones. GOALTENDING: Alaska was sharp during the first 15 minutes of the game, working hard and making good plays to create its scoring chances. But Nell played well and kept the Nanooks scoreless. “If it wasn’t for Chris Nell, we’re down after that period. It’s that simple,” Falcon coach Chris Bergeron said. Nell started both games this weekend after he and freshman Ryan Bednard had split BG’s last six two-game series. He played well overall Friday with 21 saves, but Bergeron wasn’t happy with the third goal allowed by the first-team All-WCHA selection last season. Bergeron also said Bednard allowed two many soft goals during his last two starts. “Although (Bednard has) gotten results, now, it’s who we think gives us the best chance, and, tonight, we thought Chris did,” Bergeron said. “When you’ve got a junior and somebody as popular as Chris is with our players, that’s what Chris did for us last year. When we weren’t quite right, he kept us in games until we got right. That’s what happened tonight. STRONG FINISH: After the difficult start, the Falcons righted their game and carried the play for almost the final 50 minutes. They finished with a 31-20 edge in shots on goal, including a 25-8 margin after the first period. BG swarmed the offensive zone, generating many quality scoring chances against Jones, who was very good for the second straight game. The Falcons easily could have had half a dozen goals. Jones made 28 saves Friday. “We were getting chances, and the goalie was making some pretty good saves,” D’Andrea said. “We knew one was going to come. Once that one came, there was really no doubt we were going to take that one. Dufour scored with a wrist shot from the right circle, with the help of Frederic Letourneau’s presence in the crease area. The game was delayed for 23 minutes with 92 seconds remaining in regulation after BG’s Stephen Baylis drilled UAF’s Nikolas Koberstein into the boards and the glass behind the net at the north end of the arena. The hit caused the glass to shatter. The Falcons also defended well after the first period. PK: The Falcons had another excellent night of penalty-killing, not allowing a goal in six-short-handed situations. They killed off a two-man advantage for 1:40 with the game tied 1-1 midway through the third period. BG allowed just one shot during the 5 on 3, and the Nanooks had just four shots in 10 minutes with the extra man. The BG penalty-killing was outstanding all weekend as the Falcons didn’t allow a goal in 10 chances. The Falcons kept Alaska to the perimeter and blocked a number of shots. “How we did it was being on the same page paying attention to the small little details and executing,” Bergeron said. The Falcon power play was 1 of 7 Saturday and 2 of 13 in the series. SHOT LEADERS: Baylis led BG with five shots in the game, while linemate D’Andrea, Mitch McLain and Sean Walker each had four. Despite having a bunch of chances, McLain’s seven-game point streak ended. He still leads the WCHA with 16 goals and is second in points with 28. INJURY: BG sophomore defenseman Connor McDonald suffered what appeared to be a shoulder or arm injury early in the second period and did not return. Bergeron said the injury was still being evaluated. If McDonald isn’t available to play at Ferris State next weekend, BG would be down to five healthy defensemen who have seen game action this season. Sophomore Adam Smith missed the Alaska series with a hand injury and will be out at least 3-5 more weeks. LINEUP: Although the Falcons turned in a disappointing performance Friday, they only made one change for Saturday’s game. Casey Linkenheld replaced Pierre-Luc Mercier at forward. Injuries, however, to Smith and forward Matt Meier did limit some of BG’s ability to make more changes. NOT AGAIN: Dufour’s goal came during a major penalty for checking from behind to Austin Vieth, who drilled BG’s Mark Friedman into the boards. He also received a game-misconduct penalty for the hit. Vieth didn’t play Friday, the result of a one-game suspension from the WCHA. The league issued the suspension after Vieth received major and game-misconduct penalties for contact to the head at Ferris State Jan. 14. Vieth could face supplemental discipline again from the league office for the hit on Friedman. MORE ALASKA: The Nanooks earned eight of a possible 12 points on their four-game trip to BG and Ferris the last two weekends. Jones stopped 57 of 61 shots against BG, and 138 of 147 shots in those four games, improving his save percentage to .904.